Went from a pretty nice morning to storming. 1.08 mile run. We were cut short by lightning. 5 PAX (Pirtle, Speaker, Nature Boy, Royal Caribbean, Meter Maid (QIC)). No FNGs. YHC and his Sunday School class took part in Meet Memphis on Saturday – an annual day of service with First Evan’s Memphis Ministries Partners. Meet Memphis is Cheesesteak’s baby, and he does a great job planning it. The group spent the day with the congregation at Christ’s Community Church. During lunch, the pastor of Christ’s Community Church reminded us that our true home is Heaven, and that we are ambassadors for Christ during our time on Earth. Donations for Pirtle’s van are being matched this weekend. Congrats to Nature Boy on a well-deserved promotion. Prayers for Speaker as he explores new career opportunities. Thanks to Speaker for treating the PAX to breakfast at Perkin’s. Royal Caribbean won coffeeteria with the Rainbow Pancakes. THE SCENE: Cool and Crisp! Be grateful for your family, friends, and your shield lock. My oldest son came out and Crushed the run and PT. His F3 name is Royal Caribbean. It felt good to run with family and friends! God is good! THE SCENE: Occasional sprankles. Dark. In other words, perfect conditions for some fitness, fellowship, and faith. A few PAX had HC’d but were not there at 0630. We took a courtesy lap counter-clockwise around the lake. Then we headed down the trail towards Shelby Farms. We met a large mob of deer, maybe 10 of them, grazing on the trash grass on the landfill. We turned around at Walnut Grove and headed back, then made another lap around the lake, pushing the pace on the last quarter mile or so. We ended up at an 8:57 pace, 3.96 miles. YHC heard an older, faithful man this weekend teach on pastoring. He was encouraging us to not neglect our communion with God. Then he said, “Don’t come at people with a mind; come at them with your heart.” As men, it’s tempting to do this in pastoral work and it’s also tempting to do this in your marriage and parenting. Don’t come at your wife and kids with just your mind. They need your heart – your care, conviction, and love. 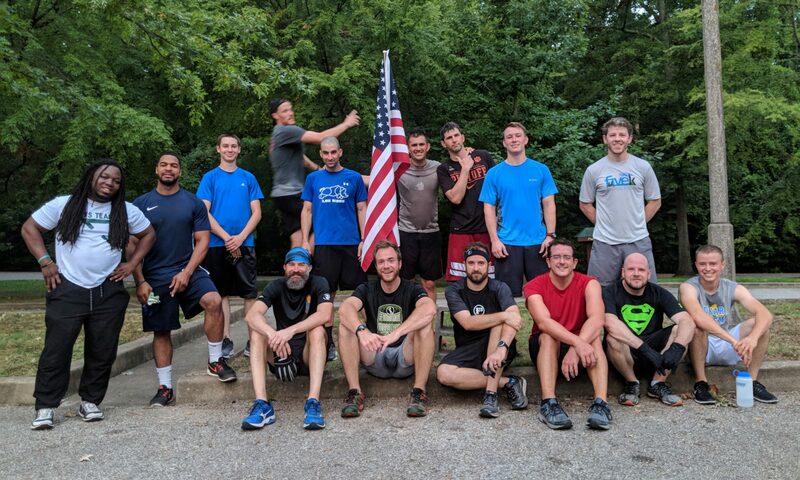 Good conversation about, among other things: smoking steaks, Pirtle’s family and his new run-only lifestyle, living with a seal, ridiculous trail runs, and the Crucible. Major TCLAPS to Watchita for being the first and only PAX to run the Green Mile immediately after joining Club 345. As we were enjoying our coffee, Slots jogged up from the Greenway trail. He alleges that he was there 5 minutes late. He made a lap around the lake to find us, but alas, he went the same direction, so we didn’t meet. Then, he headed down the Greenway. He saw lights coming his way and assumed it was us, so…he hid in the woods to surprise us. Unfortunately, it was two cyclists. Realizing his error, he sheepishly emerged from the woods in front of them so as to not startle them. They probably assumed he was hiding a body. Then, he ran up behind a Japanese couple and yelled at them! This is what we’re like running alone. Never run alone. It’s too much for one man to handle. Crucible is Saturday. Pancake breakfast after the Crucible. 4 laps around the lake. 1 mile each time. All we gotta do is run faster each lap. 2nd lap: 8:28. A bit faster than planned which will make 3rd lap a bit of a challenge. 25 pushups OYO to think of a good plan. 3rd lap: 8:18. Whew, left ourselves a manageable last lap. 25 pushups OYO. Time challenge: Beat 8 min mile pace or pay the penalty! I thought I was going to have to go it alone and then Nature Boy showed up. What a beast. He’s supposedly “just getting into running” but turns in times that suggest otherwise. Negatives is a fun + hard workout and the pushups give it just enough to take it up a notch. That last mile was fun. We probably should have pushed for a sub-7. Next time! Guy in front set pace. Single file. After a PAX would lead he would then drop into 2nd when new PAX took lead. That way the rotation would work and everyone got their turn at least once. (About every 3/4 miles) approach cross street and PAX would fall in and do Squats OYO AMRAP until PAX in rear caught up and automatically assumed the lead and set the new pace. 5; Slots. Nature Boy, Cheesesteak, Billy Blanks and O Positive (YHC). Just because GOD answers your prayers is not time to rest. His test of endurance is infinite. Get Right. Old Ballz was not ready for these young whippersnappers. Been under the weather all week but this was just what YHC needed. Grateful for the HIM who pushed YHC, covered the 6 with him and circled the wagons to make certain the buzzards hadn’t gotten ahold of YHC all while holding him accountable. So glad we had some new faces today. THE SCENE: 39 and rainy. Any colder and it would’ve been snowing. Right on Shady Grove, right on Yates, right on White Station. 4 miles. How do you define good weather? I was preaching to the choir today, but I’d encourage you to expand your definition no matter what it is. Specific challenge: when you look at the weather app, use it to dress appropriately not to dictate your plans. Park Bench – holy moly. His wife gave birth while en route to the hospital. What a story. I’m really glad we started the green mile in the gloom of winter. It has already paid dividends and we’ll be ready for more brothers to show up when the weather gets “better”. Numerous add-on miles were completed today, some brothers met at Chicfila and ran somewhere, Park Bench was on the trail early and Sparky got some pre and post run mileage in for about 60 miles today or something. Matthew 25:14-30. The parable of the talents. Focus on what you control and are responsible for, stop looking at those below and feeling good about yourself and stop beating yourself up because someone else is doing better. The PLC is getting a little out of hand. 100% retention and it lasted over an hour. Seriously though, I love this Sunday workout. It’s different than the typical F3 experience, and complementary. PAX ran two miles together. Stopped for 20 step ups on ledge and 20 squats OYO. Ran two miles back to Startex . Setting high expectations for your family and friends. Sometimes the expectations are unrealistic and we are let down when they are not met. Be more thoughtful of the individual and their capabilities. Prayers for Sparky and Pops.